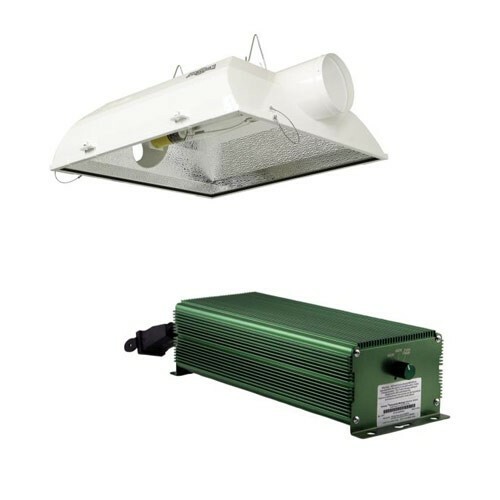 Complete 600 watt Sun System Galaxy ballast and Blockbuster 6 reflector from Sunlight Supply. Square shape is perfect for square growing areas. New improved design for more efficient and even light distribution. Completely sealed – featuring hinged glass and double gasket for an air-tight seal. Powder-coated galvanized steel housing with handles built in. Includes socket & 15 ft lamp cord. Swing Stop retention cable keeps glass from abruptly swinging down. Captured thumb screws & closure mechanism for ease of use and excellent sealing. Interior made from 95% reflective German aluminum. 6 in integrated air-cooled fittings with a bead ring to hold ducting firmly in place! Pre-programmed with a digital random start feature. It will delay 1-3 seconds each time it starts. Reduces in-rush current spikes when starting multiple ballasts at a time. These state-of-the-art ballasts are manufactured to provide today's serious grower with maximum flexibility & performance. The Galaxy Legacy is different than any other dimmable electronic ballast on the market. Lamps are only dimmable on wattages lower than the specified lamp wattage. A 1000 watt lamp can be dimmed down to 600 or 400 watt. A 600 watt lamp can be dimmed down to 400 watt but cannot be over-driven to 1000 watts. On this unit Turbo Charge is designed for 600 watt lamps only. There are three ways to use the Select-A-Watt feature: It will properly drive a 400, 600 or 1000 watt lamp to ANSI specifications. For example: Set the switch to 400 watts, insert a 400 watt lamp into your socket and the ballast will operate the 400 watt lamp. The ballast will similarly operate 600 watt lamps. The second option is to dim a 600 watt lamp. Adjust the switch to 400 watts and the ballast will dim the 600 watt lamp. The Turbo Charge feature will increase the output of a 600 watt lamp by approximately 10%. Purchase a 240 volt power cord separately.